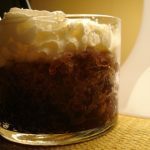 Frozen espresso granita, an intense slush, is a welcoming restorative on a steamy day. It’s important to start with top-quality brewed espresso at its most intense. Combine the espresso and sugar, stirring until the sugar dissolves. Stir in the liqueur. Chill the mixture in the refrigerator for 1 hour, then transfer it to a metal bowl and place it in the freezer. Every 30 minutes, whip the mixture, using a manual or electric beater. Continue freezing and beating the mixture until it is uniformly slushy, about 2 hours. Freeze another hour before serving. 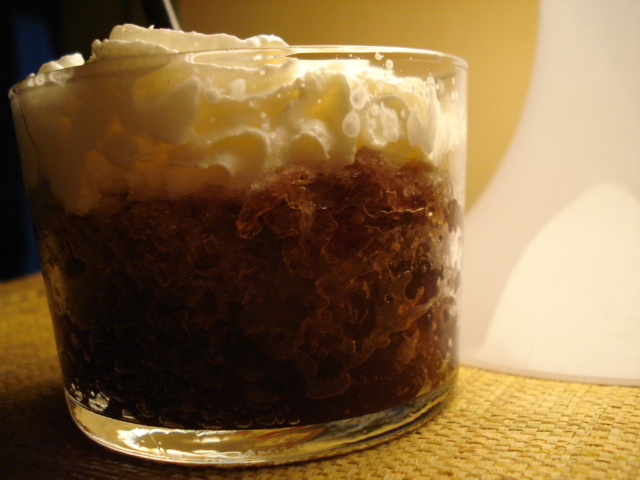 Spoon the granita into goblets and, if desired, serve topped with whipped cream.